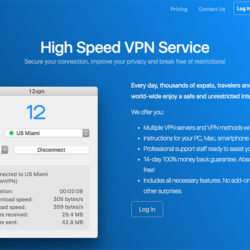 12VPN is a VPN provider based in Hong Kong. It’s not a big player, but being small and being close to China gives this provider certain advantages. 12VPN seems to have strong experience serving China users. On their website you can find special sections with instructions and tips on using VPN in China. 12VPN has server in 16 countries around the globe, including US, UK, Hong Kong, Japan, Singapore and more. Users can choose one of the three ways to use 12VPN: VPN, Auto-proxy and SmartDNS.